How far can we go? – Family Wise Ltd.
Who wants to find ‘Long Lost Family’? Isn’t that just a classic question! Clients often ask us how far back we can research their ancestry. How long is a piece of string? The influencing factors are numerous. Are your forebears from England, Wales, Scotland, France, Italy….? Do you know much about your ancestors already? If they were from England, from which county did they originate? Were they (like for many of us) agricultural labourers, or were they landed gentry? Availability of records at parish level varies enormously from one parish to the next neighbouring parish. Some churches began keeping records from the sixteenth century. Others started much later and then there is the issue of document survival as so much has taken place over the last five hundred years. Damp, fire, many Wars and much more…..
Today, I had the pleasure of working with Marc Hervieux as part of the Qui Etes-Vous? television show. 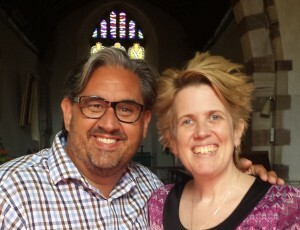 Having filmed last week in Newbury (USA), Marc’s journey continued to England yesterday (Sunday) and I met him in his ancestral ‘home parish’, as far back as our research has taken us – and that’s a long way. The programme will be aired in December in Canada and so I cannot say too much more at the moment, but it was such an amazing experience to share Marc’s journey back so far in the history books. We were very lucky to find many documents relating to his family which have survived the test of time (and everything else the centuries have thrown at them!). So, how far can we go? Well, in this particular instance, back to the sixteenth century. My own genealogy – on many lines – is stuck in the eighteenth century due to lack of parish registers for the churches where my ancestors might have been hatched, matched or dispatched…. Oh Marc, I hope you know how lucky you are!